This recipe was one of those "I-feel-like-eating-these-but-have-never-even-dreamed-of-making-them-myself" sort of recipes. However, they seemed to be a hit in my carnivorous household, so I've decided to pass along the goodness to you, my lovely reader! If there's one thing I love, it's peppers. A pizza isn't a pizza without the green peppers. I mean, have you ever tried them on a pizza? When they cook into the cheese, it's one of the best tastes you'll ever taste in your entire life, no joke. But I digress. 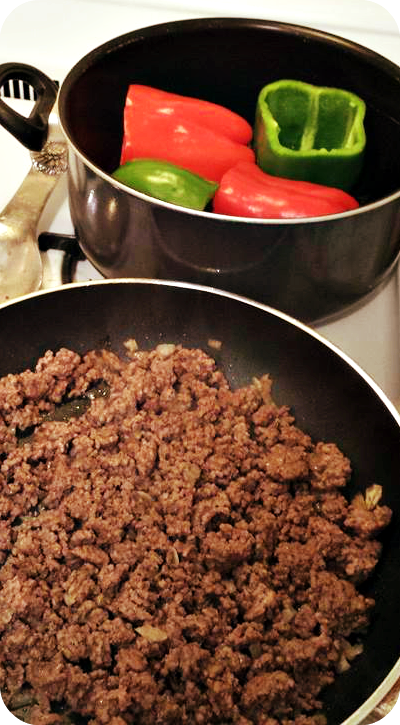 To begin, you must wash and prepare the peppers for stuffing. 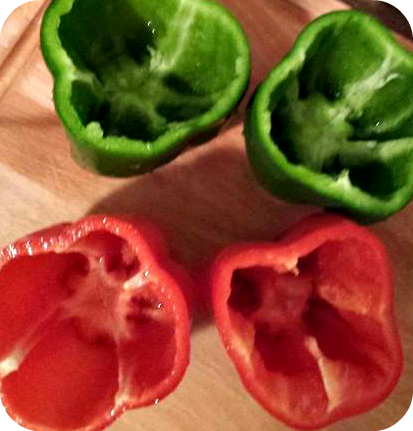 Cut a thin slice from the the stem end of each pepper and remove their tops, then remove their seeds and membranes. Rinse. To be sure that the peppers stand up straight in the pan, you may have to trim down their bottoms as well. In a large pot, add enough water to just cover the peppers and heat to boiling. Add peppers, cook for about 2 minutes, then drain. In a large skillet, cook the beef and onion over medium heat for about 8 to 10 minutes, stirring occasionally, until the beef is browned. Drain excess liquid. Stir in the rice, salt, garlic, and 1 cup of the tomato sauce. Cook until the mixture is hot. 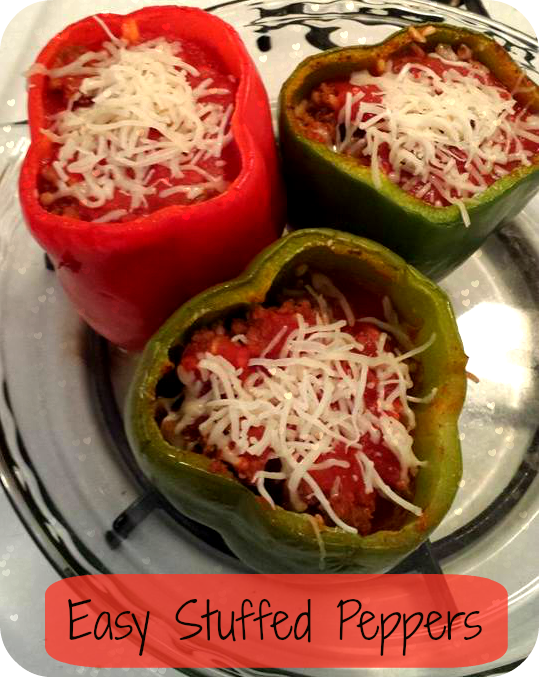 Preheat the oven to 350 and then begin stuffing the peppers with your delicious mixture of goodness. Stand the stuffed peppers upright in an 8-inch dish (or use a glass pie plate like I did), then pour the remaining can of tomato sauce over the top. Cover the dish with foil and bake for 10 minutes. Uncover and bake for 15 more minutes or until peppers are very tender. Sprinkle with cheese and enjoy!